I had to laugh a lot during the interview with Baumbarons new apprentice Vitus Wahllaender. Vitus is a very humourous guy with a big heart for treehouses. This also is the first time I introduce someone from the Baumbaron team, at the same time this shall be the beginning of a centuries old tradition. Why did I pick him first? Well, just before Vitus joined Baumbaron he built his own treehouse while working on his bachelor thesis. An I wanted to know more about that. He came up with the idea of having an own retreat in the trees long before that, when he and a couple of good friends started to build a treehouse from fallen wood in the forest. He told me about that magic place, hidden beneath an old beech tree right next to a little idyllic mountain stream. Week after week he and his friends met at the campfire, invited more friends, played some music, listened to the nature, daydreaming and continuing to build the cabin whenever they felt like. Everyone was profoundly thrilled with this mysterious place. Vitus, how did you plan your project? I designed the supporting structure using SketchUp, that way I got a good feeling for the proportions. The rest was hand drawing little by little and improvising on site. So how did you start then? With a pencil and the bare necessities. Since the tree- or more the stilthouse it really is, is located not far from my parents house, I first thought about what function I wanted it to have. First of all I wanted it to become an oasis of peace, a special place far from daily life, where you can dangle your legs and soul. A place to sleep and a tent-feeling was also important to me. Therefore I took a cozy bed as foundation and planned a simple house around it with a structure as open as possible. The weathered wood, so the roof shingles, terrace and outside siding are made of local larch wood, for the rest I used spruce wood. Inside I also used larch for the roof siding, which creates a nice contrast between the reddish wood and the bright spruce rafters. Did you have any helpers? A lot of friends, some neighbours and my family – that’s how work becomes real fun! Thanks again for the strong support! How did you actually find the perfect place? 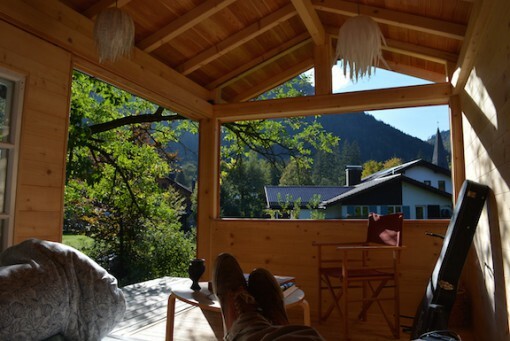 The house sits in a snug corner on my parents property close to the lake Schliersee. Right next to it there is a small stream which burbles and then vanishes into a cave. Unfortunately the big ash and the maple are on the neighbours property, so I had to build on posts. Would you reveal for us how long the construction took you? Longer than i thought – classic. Tell us which experiences did you gather during construction? I learned how releaving it is to exercise a craft, how satisfying it is to be able to see and feel what you accomplished after a day of work. Therefore to me the project definitely was a turning point in my life. I was always scared off by the idea to shrivel in an engineers office in front of the computer after my degree. I thought: If I shrivel, I shrivel in the fresh air. 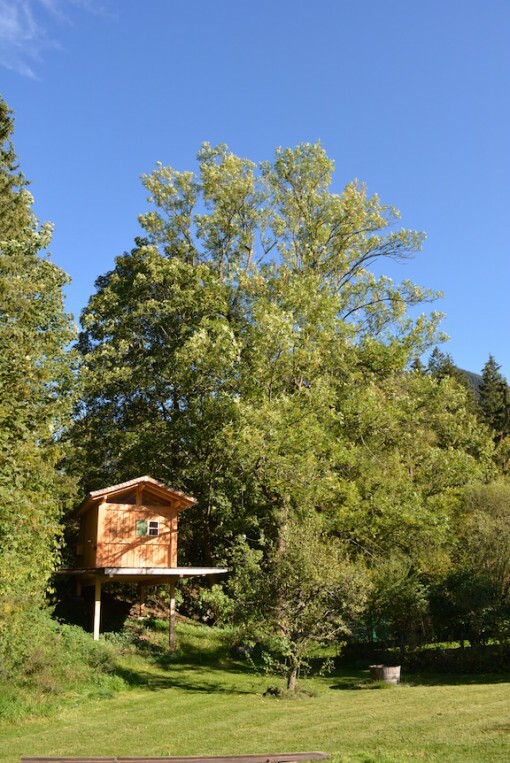 As fate would have it I met the treehouse builder Johannes Schelle (Baumbaron) during the work on my bachelor thesis and soon after that I was sure I found my vocation in this and the job of my dreams was just one step ahead. Now I’m a proud member of the company, doing my apprenticeship as a carpenter and I’m very happy with that! 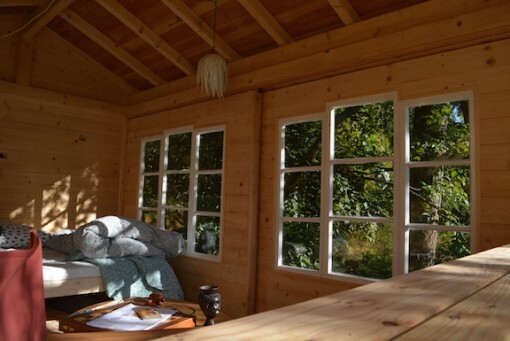 The combination of wood, craft, creative freedom and fresh air is just what I’ve always been looking for! Altogether I learned once more how important it is to listen to your gut feeling and to let yourself drift with your dreams, instead of watching other peoples ideas and concerns! 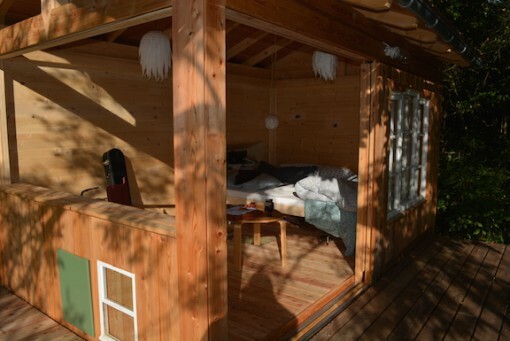 What would you say is special about your treehouse? 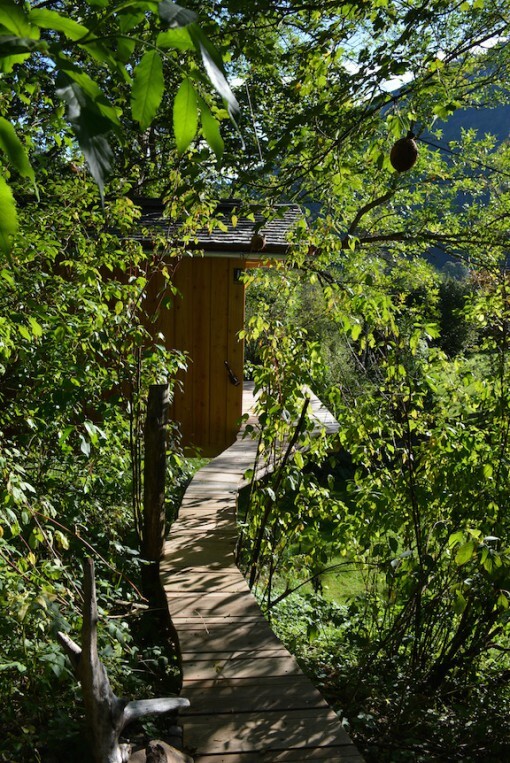 That of course is a matter of opinion: for me it already starts on the way to the treehouse, I waddle through the garden, pass by the fireplace and along a small path which leads to the stilthouse. Above me there is a self-made light chain made of coconuts, showing me the way at night. Step for step I leave my daily routine behind me and finally get to the patio and accompanied by the twittering of birds and the rustling leaves the stream slowly lets his gurgle sound. I then open all the doors, lay down and watch the sun wandering across the mountain tops… for me the cabin is an epicentre of spartan coziness. In the treehouse itself I built in some little specials: there are sliding doors made from old windows mounted on old rollerblades to be pushed back and forth; there is a wall which can be lowered down with a crank, doubling as a counter that way; there is an attic window, an illuminated mirror ball whose reflexions dance through the leaves at night, and so on. Say, does your treehouse actually have a name? 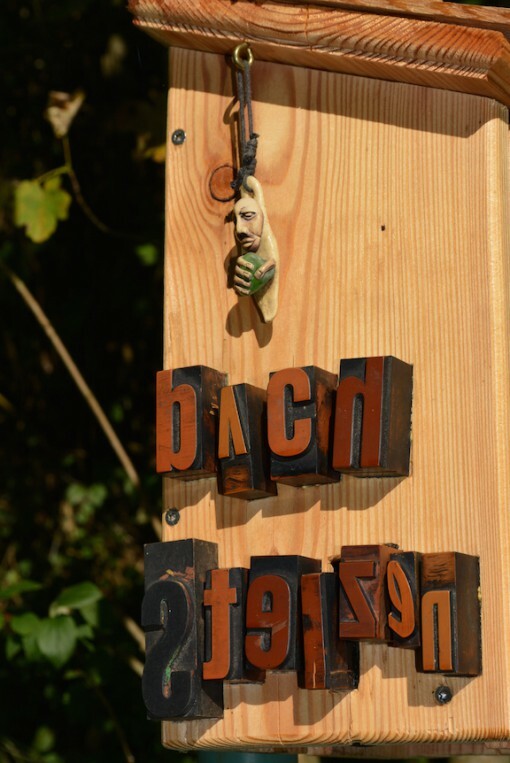 „Bachstelzen“ („Wagtail“, name of german event organizers) was pretty obvious: a creek, a house on posts, many birdies and good memories of the Fusion (event organized by the „wagtails“). Did you also have a treehouse when you were a child? I had the luck of growing up on the countryside, so there always was a hidden treehouse somewhere to bust around and dream: from ramshakle platforms up to bigger and bigger shacks – all being magical places of which only good memories exist. Would you like to permanently live in a treehouse? To me there’s nothing better! 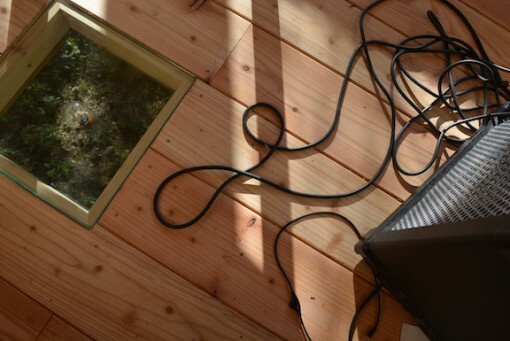 Last summer I spent whole three months in my little house. There were always friends visiting me, we made music, mulled over the chessboard, read, cried, laughed and had fun. Also the lonesome nights are really interesting: you basically sleep in the open, you sense every change in temperature, lie awake wenn a thunderstorm rages above you: you hear every noise, crawling animals, cracking branches and you wake up in the morning dawn together with the birds and squirrels strolling on the roof. After a while your body adapts to this rhythm of nature. This lifestyle is so hearty that it’s been really hard for me to sleep in a normal house again. 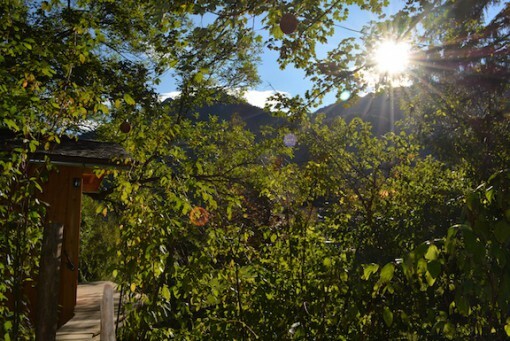 What don’t you want to miss in your treehouse? A picture of Lothar Matthaeus. 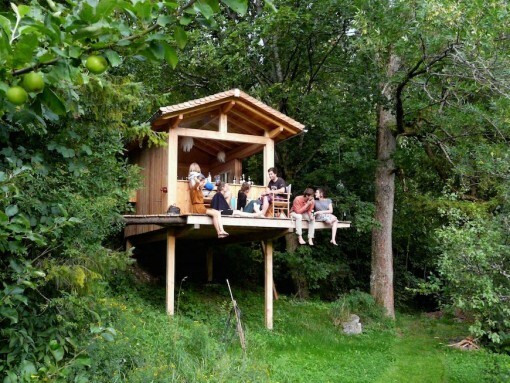 Which special person would you invite to your treehouse and why? Grounded people who like to laugh and are full of nonsense. Is there anybody you wouldn’t let into your treehouse? Which band gives you a private concert on a friday night in front of your porch? Vulfpeck with Helge Schneider – how awesome would that be! What’s the perfect treehouse drink for you? What would be the perfect treehouse snack? Nuts. I learned that from the squirrels. 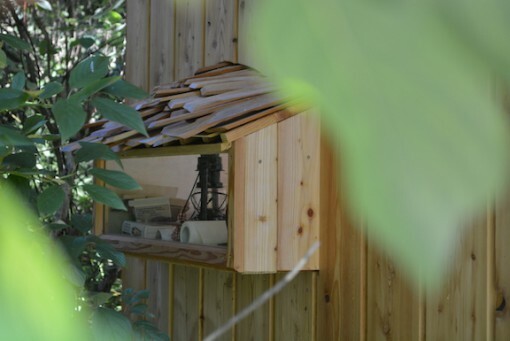 Which read do you take up to your treehouse? 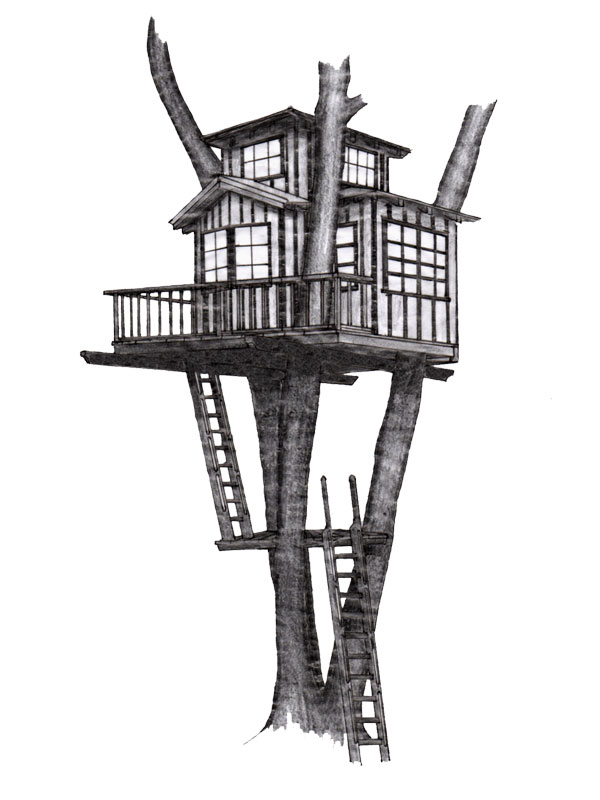 And what does a treehouse stand for in your opinion? It stands for this magical place I was talking about earlier. I don’t know why, but a big tree radiates something very special. It has something calming to it, like the crackling of a campfire, the sound of the ocean or the twinkling of stars. Being close to that old giant and that being-above-the-ground is something inexpressible beautiful!